Details: Automatic presser-foot lifting, automatic top & bottom thread trimming, automatic speed adjusting, low investment; but the productivity had been greatly enhanced. 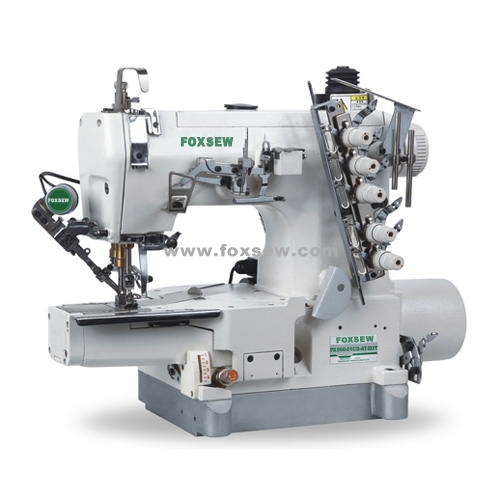 Electrical yarn cutter that can be operated simply by stepping on the pedal backwards can quickly cut off needle yarns, looper yarns and feed needle yarns (upper needle yarns). Applicable to: common sewing, common knitting wear, leisure wear, sports wear. World's latest technology, perfect combination of mechanism and electronic control. New interlock machine model applied with direct drive technology. Simple model with driving speed adjustable to ensure precise needle stopping. Automatic thread trimming, presser foot lifting are very popular among the users with more models available. 2. New oil reversing system to prevent oil leakage. 3. Sealed design of needle bar structure to ensure safety and clean. 4. Complete oil supplying and filtering system to ensure the maximum speed up to 5000 points per minute. remark: can be equipped with the direct drive equipment. please equipped the rear puller, when sewing the blanket and super heavy materials.